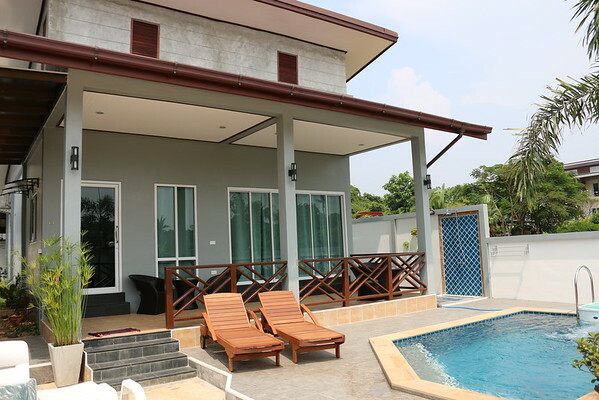 Villa Sita is a modern style 2 bedroom villa with a private pool and high wall for privacy. 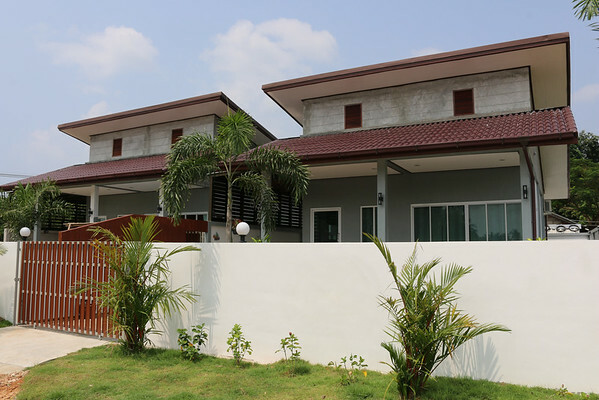 The villa is located in a quiet area near Klong Khong with a secret beach only 300 metres away. 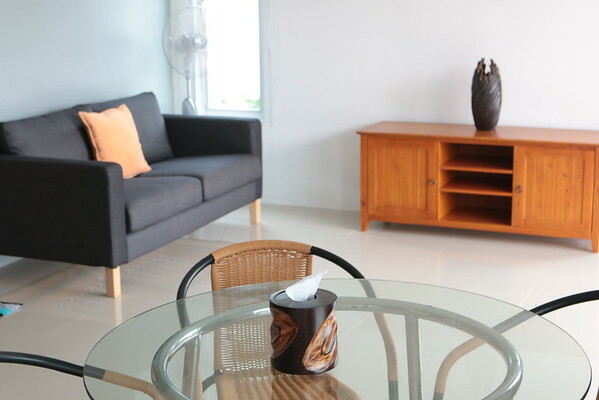 It is a short walk to Klong Khong for bars, restaurants and convenience stores. Villa Sita is actually 2 villas built next to each other on a private strip of land. Each villa has its own private garden and private pool with a high surrounding wall. Each villa is identical in layout and size. The design is clean and modern with small touches of Thai decor throughout, the only difference between them is the colour scheme. Built in a quiet location which offers privacy and seclusion. The villa is surrounded by a high wall and gate. Staying at Villa Sita will allow you the chance to really relax and unwind, perfect for couples needing some private time away or small families. Inside the villa the lounge, dining room and kitchen are all open plan. When entering the villa you will be not only surprised at how large and roomy the villa feels but how clean and well presented it is and you will instantly feel at home. The lounge offers a comfortable sofa with smart TV, no cable or satellite connection but you can watch what you want via the internet. The villa enjoys free wifi and plenty of sockets to plug into. The lounge area is also not air con but does enjoy a standing fan. The villa is also angled so the direct sun does not penetrate the lounge through the windows – if it does become hot you can open the bedroom aircon and leave the door open – the air circulates very well. Most people will prefer to relax on the terrace by the pool. The lounge area also enjoys ceiling to floor glass sliding doors allowing direct access to the outside terrace. You can leave the doors open making the villa feel even larger and at the same time allowing in the breeze. The inside dining area and kitchen are have a swing door used for entry and exit – the kitchen is fully equipped with all your needs coffee maker, toaster, kettle, fridge freezer, gas hob, microwave oven and the cupboards are well stocked with table wear, cutlery and glass wear. Behind the open plan area are two doors allowing access in to the two double bed air conditioned bedrooms with other doors flowing in to their own private en suite bathrooms. Both bedrooms and bathrooms are set out the same. 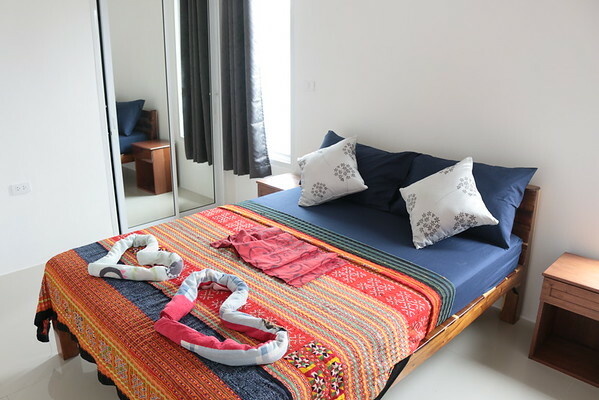 The bedrooms are air conditioned with double beds, nice decor and pictures sourced from Chiang Mai and fitted wardrobes with storage area. 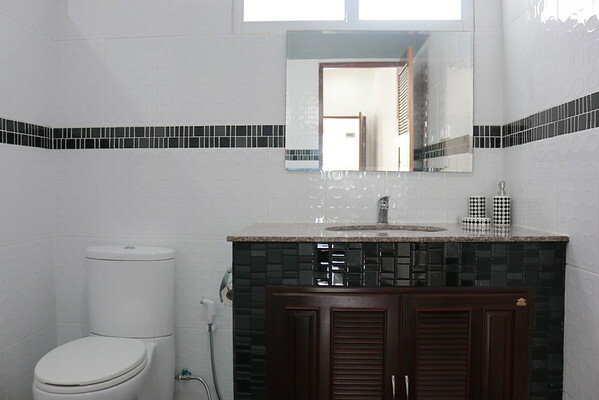 The private ensuite bathrooms have western toilets, wash basin, separated rain shower. Near the wash basin there are also plugs for shavers and hairdryers. 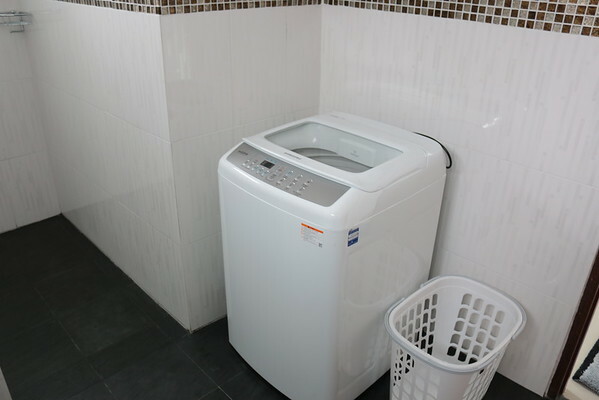 One of the bathrooms will also have a small washing machine for you if you would like to use whilst you stay. The second air conditioned bedroom is set out as the first bedroom. 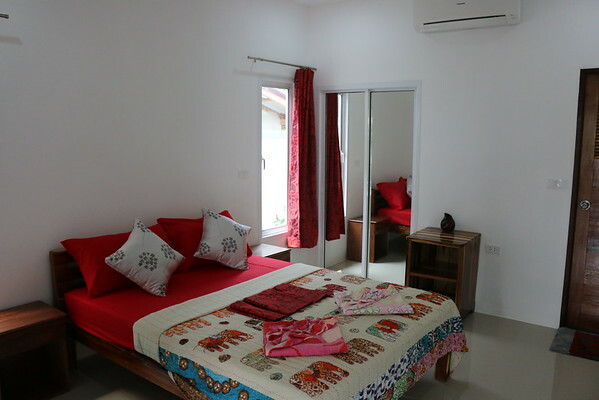 Double bed, nice decor, pictures sourced from Chiang Mai and fitted wardrobes with storage area. The only difference is the colour scheme in the rooms and the bathrooms. 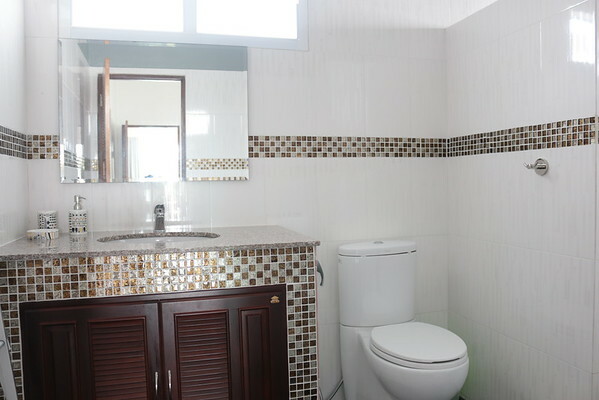 Your private ensuite bathroom connecting the bedroom also has western toilets, wash basin, separated rain shower. Near the wash basin there are also plugs for shavers and hairdryers. Both bathrooms have a separated rain shower. 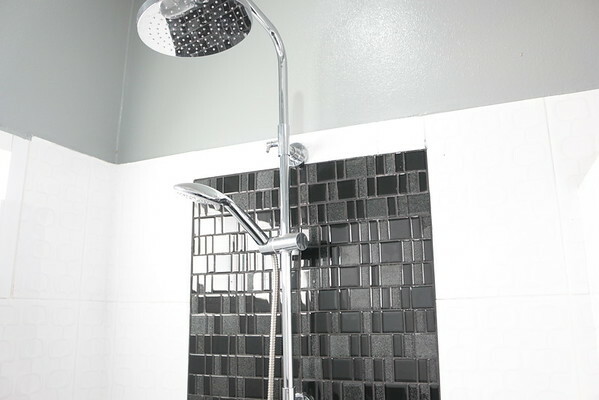 The tiled wall built wraps around the shower and allows you to shower and not make everywhere wet. Towels are provided at check in. The outside terrace with tables and chairs is built under the roof of the villa. It offers shade on a hot day and you can still sit outside if it is raining. The area is nicely lit at night and outdoor plugs sockets allow you to stay connected. When sitting on the terrace areas you will see a stunning tree scenery above the villa wall and views of the garden areas and pool. A perfect place to relax. 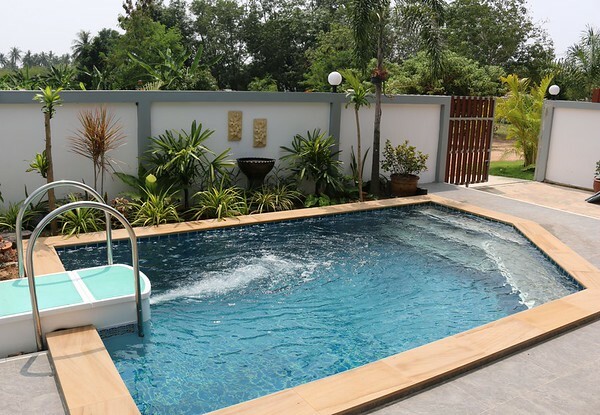 The villa has its own private swimming pool 5mtr x 3mtr and sun deck area furnished with loungers. The surrounding wall is built high enough to keep the grounds very private and no other properties at all are overlooking you, in fact there no other properties on this land. 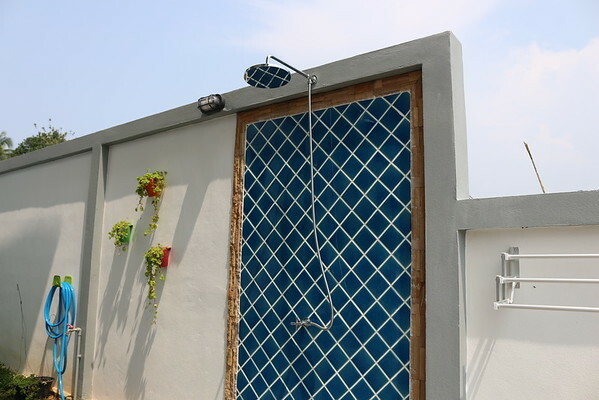 To the side of the pool is a nice outside shower facility with cold water. There is also a small garden area running down both sides of the villa if you prefer to lounge there. Where Is Klong Klong Beach On Koh Lanta? Klong Khong Beach is located in the centre of Koh Lanta. It’s the third-nearest beach to Saladan Village, which is where all visitors to Koh Lanta arrive, so Klong Khong Beach hotels have a transfer time of about 20-30 minutes from Saladan to anywhere along Klong Khong Beach. 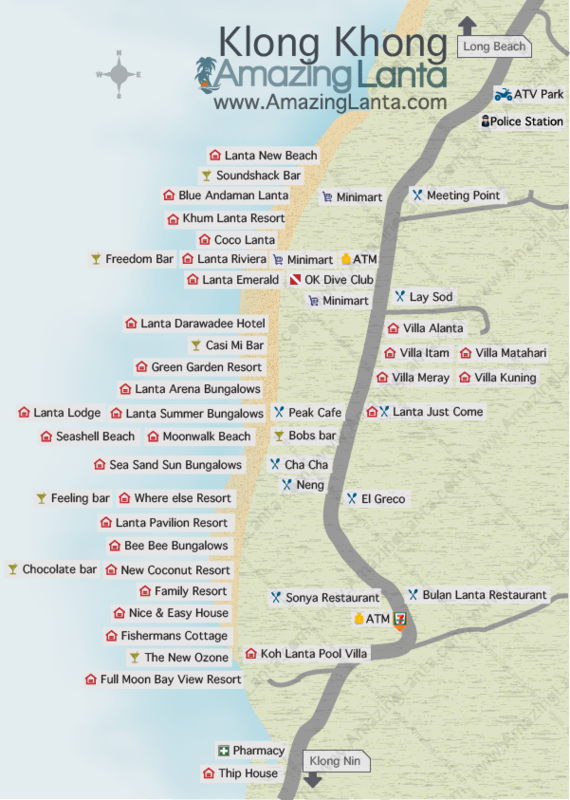 For a more detailed map of Klong Khong Beach itself, see our Google Map below. As Klong Khong Beach is smaller than neighbouring Klong Nin, it is not that developed with a handful of hotels and restaurants. (See our Best Klong Khong Restaurants guide for more info). If you need more variety, a quick tuk tuk ride to Klong Nin provides lots more options on Klong Nin Beach itself, and there are also many places to eat along on the main road too. It’s also a short taxi or motorbike ride from Klong Khong over to Lanta Old Town, just over the other side of Koh Lanta, which has some beautiful old Thai wooden houses and several seaside restaurants and bars to enjoy. If you are arriving at Krabi airport or Phuket Airport booking an Express transfer will allow you to transfer quickly, safely and direct. Our driver will be waiting for you upon arrival at the arrivals gate with your name on a plaque then its a combination of minivan and speedboat travel direct to the villa. If you arrive very late at night the speedboat may not be operating, however you can normally still arrive on Koh Lanta the same day by using the Private Minivan service. If you are already in Thailand you can also be picked up from your Hotel, with a time that suits you best and safely transferred directly to the Villa by using the Express Transfers from popular areas like Ao Nang, Krabi Town, or Phuket these areas are also serviced by using the Private minivan. Villa Sita is managed by Nick who will meet you upon arrival, give you the keys and show you around the villa. Nick has lived on Koh Lanta for several years and will be happy to offer his expert first hand knowledge and also be happy to help and advise you with any problems you encounter whilst you stay. Nick can also help you organise motorbike and car rentals on the island and day trips. Then on the day of departure Nick will come to check you out of the villa and to say goodbye. Don’t forget to book an Express Transfer for your return to Krabi Airport or to any other close Thailand destination. What’s Nearby To Villa Sita? 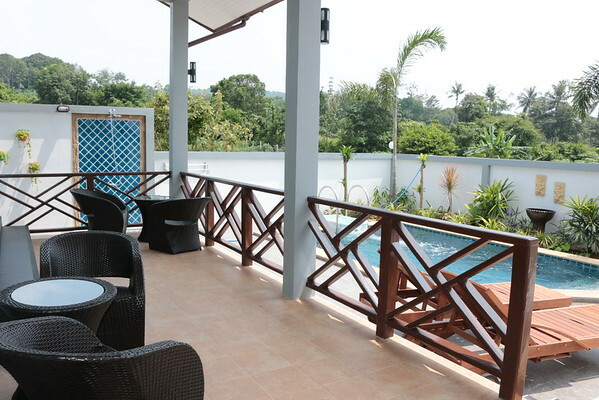 Villa Sita is well positioned 1km from Klong Khong Beach. It sits back around 150 meters from the main road. It is easy to walk to Klong Khong Beach even with strollers. Villa Sita is located near Klong Khong Beach which is a very friendly, relaxed beach area and takes no more than 10 minutes to walk to. Along the beach you will find many established beach bars and restaurants how ever along the road side it is not as developed as other areas with only a handful of Thai restaurants, convenience stores and coffee shops. Turn left along the main and walk 5 mins you will have a 7 eleven 24 hour convenience store. There are fresh fruit and vegetable stores located here also and opposite the road you will enjoy the Meeting Point Restaurant where the Massaman Curry is very good. A little further along the roadside on the left side is a small Thai Seafood restaurant is called Lod Yao here the food is excellent – highly recommended is Goong Tod Kratiam Prik Thai (Shrimp fried with garlic and pepper) Lard Nar Talay (large noodles in gravy with seafood). There’s also the Kunda Anti Pop Cafe vegetarian restaurant serving great crepes, breads, turkish coffee and above all a great place to hang out with great hosts. Neng Restaurant and Bula Restaurant sit at the bottom of Klong Khong road which is opposite a 7 Eleven 24 hour convenience store. On the right side along the road there’s Peak Cafe serving nice coffee and sandwiches, and try Sonya Restaurant. On the Klong Khong Beach all the resorts have their own restaurants. The Riviera resort has a very tropical feel to it with the restaurant on the beach. I would suggest also head to Fishermans Cottage which is situated behind the 7 Eleven, here the food is always amazing and presented nicely. For Drinks the best places to hang out are the Sound Shack, Feeling Bar, Chocolate Bar and Fishermans Cottage, how ever there are many more beach bars to choose from, you only have to walk along the beach. See more recommendations for places to eat on Klong Khong. 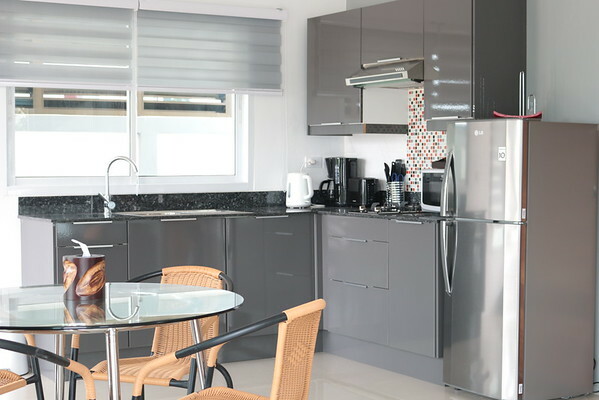 Please see our Khlong Khong Beach page for more information about the area and please see below for a full list of amenities near to the villa. 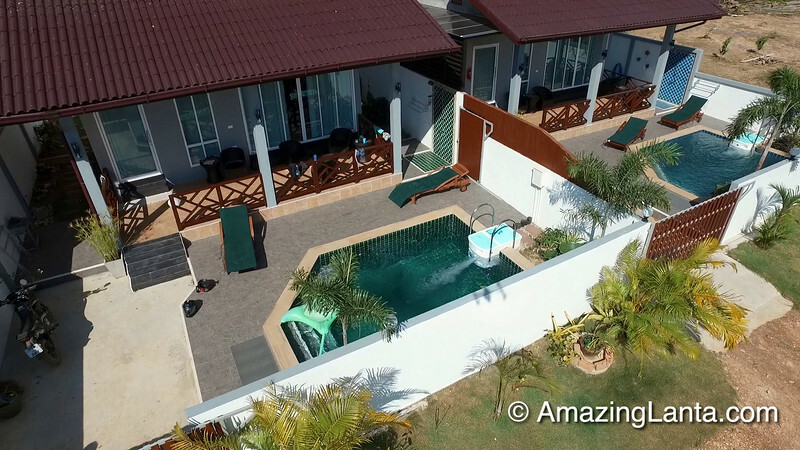 You will find many enjoyable things close to the Villa with in easy walking distance, however Koh Lanta is around 35 km long so for a stay renting a car, motorbike or Tuk Tuk would be advised. You can hire them on daily or weekly basis and Nick the villa manager will be happy to help and organise these rentals for you when you arrive on Koh Lanta. If you are not comfortable with a bike or car then you can easily travel back and forth on the island by using the local Tuk Tuk drivers. These can be a lot of fun and the locals with there friendly manner will entertain you as they go. How ever even after negotiating a good price this option does start to become expensive as each ride is charged per person. To find a taxi driver just wait next to the road and they will stop instantly. When you are in Saladan the main Koh Lanta Shopping area, if you walk out of the centre there are many queing up to take you home. How ever later at night this service can become sparse and getting home from a party at 3am can become a challenge. Upon on booking a villa we will also provide you with local contact Tuk Tuk driver numbers who we trust will take you home safely any time of the night. Whether you are travelling with friends, a romantic couple or a family with small children Koh Lanta offers many activities for you to enjoy. Take a day Kayaking, ride on an Elephant, enjoy time at the monkey school or squirm at the snake show. Go Deep Sea fishing in the day for Marlin and Barracuda or at night you can fish for squid. A Golf driving range is at hand to keep your swing in or try something new like Yoga, paddle boarding or windsurfing if the winds are right. If you really want to get in to the culture you can enjoy an evening watching Muay Thai in one of three Koh Lanta stadiums or get your tongue around the language with a Thai for beginners class. Koh Lanta also offers amazing natural beauty with two Caves to explore and a National park full of virgin rainforest with wild monkeys not forgetting a waterfall in the green season and a butterfly farm.